Here’s the first Shadow Giller Jury review, Trevor’s thoughts on Going Home Again, by Dennis Bock. I have only posted the opening paragraphs — for the full review click here. I love being a part of the Shadow Giller Jury (headed by KevinfromCanada, who is writing up a lot more than me here). It’s one of the best things that has come from my blogging. This will mark my . . . fifth year? Holy cow, time flies. 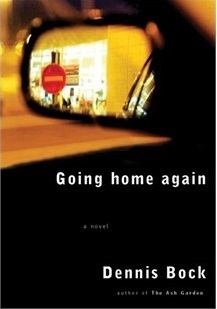 So, with yesterday’s announcement of the shortlist, my work begins now: Dennis Bock’s third novel, Going Home Again (2013). I won’t be coy. I didn’t like this book, despite the fact that it treads on one of my favorite themes: memories of the past, especially those we hoped we’d forgotten, haunt the present. When the book begins, Charlie Bellerose, our first-person narrator, has just learned that someone with a strange name is dead, and Charlie’s brother is missing. We then quickly flash back one year, to the summer of 2005, and find Charlie returning to his home in Toronto. He’s just separated from his wife, Isabel, and left her in Madrid where they’d lived for nearly two decades. With that separation, he’s also left his twelve-year-old daughter, Ava. And so, here he is, returning home again, to a life he’d been able to forget mostly, since he was so far from it. In Toronto he is nervous to reacquaint himself with his brother, Nate. The last time he spent any time with Nate was over ten years ago, in 1993, when Nate visited Madrid and made a complete idiot of himself. Wary, Charlie is surprised to find that he likes his brother, who is also going through a divorce, one that separates a family with two boys. I will say that I was already having a hard time with this book at this early stage, and it may well have been an issue of timing. I was very impatient with it from the get-go, finding the dialogue strained first, and then getting annoyed because I felt I could see Bock’s manipulations all over the place as he put the pieces of his story into place. The book comes off as a series of set pieces, and most are misfires since they attempt to add some intensity and metaphor to the story but then Bock balks just as those set pieces begin to take over the story. Consequently, the intensity is undercut, the themes suffer in the background, and the novel feels uneven and unsure.